With Martin and Sims both being healthy when Jacquizz Rodgers got the call from the Bucs, he didn’t expect to stay in Tampa long. He only packed a few clothes and sent the rest of his belongings to his house in Houston, Texas. 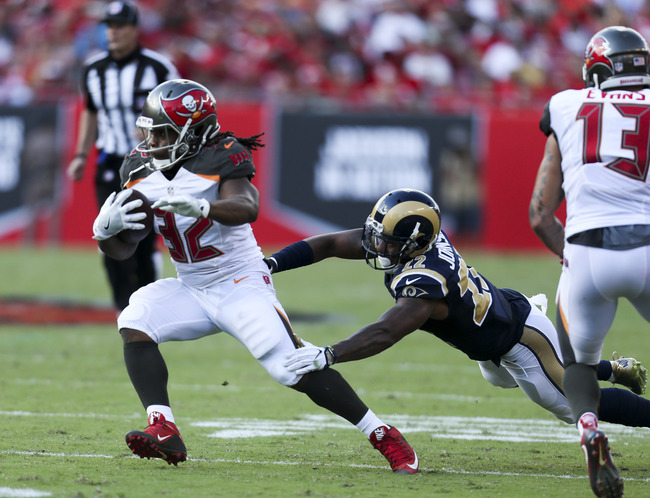 However, following a week 2 hamstring injury to Doug Martin when he made a cut on an outside pitch, Rodgers ended up at the number 2 spot less than a week after joining the team. Then after replacing Martin as the starter, Sims ended up with a knee injury in week 4 against the Broncos and that quickly, Rodgers found himself being the featured RB in a Monday night football game. As everyone already knows, he ended up rushing for 101 yards. For the first time in weeks, Winston didn’t have to rely on throwing the ball 40-50 times. Fewer throws will almost always mean less room for error. He’s expected to get the start again on Sunday against a team that’s given up the most rushing yards in the league, averaging 174.5 YPG and 1,047 total on the year. If Rodgers can exploit that weakness, I think our offense will be able to easily keep up if our defense gets burned again. I’m glad Rodgers is showing that he can produce when needed and he’s hopefully found his home in Tampa. I’m also curious to see how hard a Martin/Sims combo will hit now that they’ve seen what Rodgers can do. Charles Sims placed on IR and running back Russell Hansbrough promoted. Will Jones Finally Deliver “Explosive Runs” For The Bucs? Rodgers shines on the big stage. Previous articleClinton McDonald returns to practice.